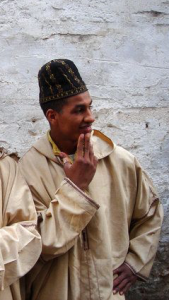 On a trip to Morocco a few years ago my companion for the day was pretty tense. It had all started when the tour operator on the coach had gathered up all our passports and tickets for safekeeping. Clearly in the past a number of tourists had fallen prey to pickpockets and so this collecting of travel documents was now standard practice. Unfortunately my friend was clearly focused on the fact that she did not have her passport or ticket with her, rather than anything else. Our trip into the Kasbah had done nothing to lessen the tension and unfortunately a sequence of events followed that were guaranteed to make matters worse. The first incident was when I and another member of our small party noticed that we were being followed by a youth of 18 or 19. Wherever we stopped so too did he. In any normal situation it would have been a source of humour, because he had all the undercover skills of a two year old. His attempts at nonchalance were worthy of Mr Bean. Nevertheless, I mentioned this to my companion and watched in amazement as she shot to the front of the tour group like a scalded cat. When we mentioned it to the tour guide he just turned and told the youth to go away – which he dutifully did. The guide explained that there was nothing suspicious about it – just that the boy was a little ‘touched by Allah’. We continued on with our tour and once again I noticed that a man kept appearing – but this time he was taking photographs everywhere we went. Not only that, but he would disappear and then reappear a short while later as though he knew where we were going to be. Afterwards the reason became obvious, but for the moment it was once again somewhat disturbing and my companion was getting decidedly spooked by the whole thing. It turned out that he was in league with the tour operators and wanted to flog us ‘scenic pictures’ as mementoes of our time in Teouan. Fortunately, at this time our guide announced that we were going to finish the tour by going to ‘a big shop’ where you can look at things you might wish to buy. Images of a western style department store obviously filled my friend’s mind and the thought of browsing – a mild form of shopping therapy even – worked wonders on her sanity. That is until we arrived at the big shop! Forget ideas of Macy’s or J C Penney, forget even the wonders of Walmart – we were shopping Moroccan style and entered a collection of houses that had been turned into a carpet seller’s palace. After a quick tour up to the roof where we were able to look out over the rooftops of the entire Kasbah and see where the various mosques and prayer places for women were we then returned down to a central hall. Our group was pretty small from the outset – Three Spanish, Two Italians and two Brits – Now we were divided up once again so that each nationality was given an interpreter to help us with our visit. To get you in the right frame of mind perhaps it would be best for you to now imagine yourself in the same situation as my friend. You have lost your passport, you have no return ticket, you have seen a madman following you and a furtive photographer – and now you have been separated from the others in your tour party. OK – Are you starting to get a little tense? I can assure you that my companion was quite capable of turning ten inch nails into screws with her tension levels at this time. And suddenly we were asked if we would like a drink! ‘NO! Nothing thank you,’ was the immediate response of my companion who proceeded to sit on the edge of her seat with knees so tightly clamped together that you could be sure that there was NO WAY anyone would get anything from her. At the time I was not really able to see quite how frightening it was and so I asked for a mint tea – after all it seemed sensible to have the national drink. Our interpreter then explained that he would like to show us some carpets, as we had time before our tour continued. I agreed – after all this was all part of the tour and they were unlikely to do anything too dangerous to us (bad for business you know). The floor show began and we watched as carpet after carpet was unrolled for us to see and it was a fabulous opportunity to see all the styles and differing types of carpet – all the while being accompanied by some of the best sales patter I have ever heard. Eventually we had gone through examples of the various stocks and styles and it was time to get down to business. The system was explained. Our interpreter was a freelance sales person – he would get a commission from the owner and also from us. Whether we bought anything or not was entirely immaterial we were just being given the chance to buy. My companion took this with a pinch – well OK with a bucket, of salt and refused to be drawn into anything more. I, on the other hand had seen a carpet I quite liked and so was up for the next phase. 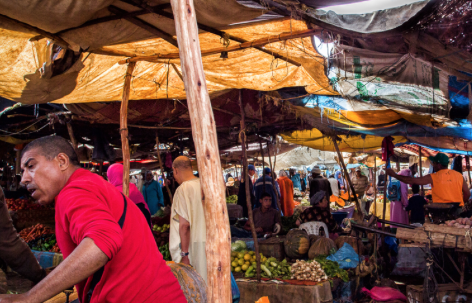 Haggling or bargaining is essential to any business deal in Morocco and so we started. He offered me his best price for two carpets – I collapsed with horror and said that I had better not waste his time. And this was where the fun started for me at least. Basically I knew from having lived abroad for a few years when younger that there was a certain etiquette that we should follow. But a little devilment took over and I decided to do things a little differently. I was going to join in the bargaining with a twist. I apologised profusely to the carpet seller and explained that there was absolutely no way that we could ever meet on price – I was a poor tourist – I was sorry for taking up his time but I could not even think of a price that would not insult him and so we should forget this whole thing. I thanked him for his hospitality and the mint tea but regretted that I could not even deign to mention a price – the difference was too great. The carpet seller was somewhat taken aback but was not totally put off. ‘Just give me a number please’,’ he asked via the interpreter and handed me a small pad and pencil so that I could write a number down. I assured him that it was too fine a carpet for the small amount of money I had and so asked his forgiveness. And I resolutely refused to write anything down. This procedure went on for a good ten minutes, each time the carpet seller reduced his asking price and each time I became more and more regretful. Not only regretful but terribly apologetic about wasting his time, because he clearly had great carpets and so needed to find much wealthier customers than myself. Cutting a lengthy tale short, the silk carpet that I really did want had been offered to me at around 900 dollars US and I apologised for not having the money to buy it. He started to become unsettled – Would I please give him my best price – so that perhaps we could negotiate? He became even more agitated and asked me for my price – which I reluctantly gave him – just 50 dollars – and I apologized for the umpteenth time. We ended up agreeing a price of 100 dollars – Honour all round was kept and I now have a wonderful memory of Morocco in my bedroom.